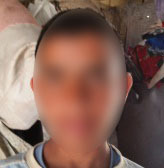 On 31 May 2015, a 15-year-old shepherd and his uncle are detained by Israeli soldiers near a settlement and released without charge or explanation 12 hours later. I was detained near the Bedouin tent my family and I live in to the north of Mikhmas. Our tent is near the settlement of Ma’aleh Mikhmas. It was around 9.00 a.m. and I was with my uncle herding sheep when suddenly we noticed a group of Israeli soldiers leaving the settlement and approaching us. The soldiers left through a gate in the settlement’s fence and started to talk to us in Hebrew but we didn't understand what they wanted. Then one of the soldiers aimed his gun at us and gestured to us to follow them into the settlement. My uncle tried to explain to them that we couldn’t possibly leave the sheep on their own but they did not pay attention to what he was trying to say. When we got to the settlement the soldiers asked us to sit on the ground in the sun for about three hours. It was a very hot day. The soldiers did not tell us why we were being held. They did not give us any water. Then they took us to the back of a jeep and made us sit on the floor next to the soldiers’ feet. The jeep drove for about 15 minutes and then stopped at a nearby military base. At the camp a soldier tied my hands to the front with one plastic tie. The tie was painful. They did the same to my uncle. I remained there until around 8.00 p.m. and no one told me the reason for my detention. During this time we were not given any food but we were given some hot water and a glass. My uncle and I helped each other drink with our hands tied. I asked the soldiers if I could use the bathroom but they refused. I felt tired and hungry and I worried about the sheep which were left alone. At around 8.00 p.m. a soldier removed the hand ties and released us. My uncle and I walked for about 20 minutes and then we stopped a car which took us home. We arrived home at around 9.00 p.m.